An Automatic Weighbridge is being used at an NSW power station to track the weight of flyash being removed from the site. 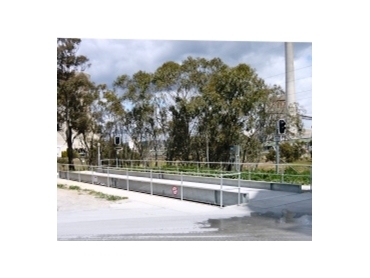 The automatic weighbridge which was commissioned by Accuweigh ’s Sydney branch measures 20m and is used for weighing short wheelbase trucks. It can operate without the need for an attending weighbridge operator. Accuweigh’s automatic weighbridges are fitted with a Driver Control Station (DCS), traffic lights, a remote display and a RFID Reader. Trucks fill with flyash from the overhead silo before driving onto the Automated Weighbridge System which captures the weight of flyash being taken from site. Each truck is fitted with an RFID tag which automatically transmits the truck’s ID details (including Tare Weight) to the Driver Control Station which then processes the truck weight and advises the driver to exit the weighbridge. The Automated Weighbridge System was required due to the mine site classification which prevents truck drivers from exiting their trucks. Each week, the DCS generates a report of all weighing transactions from the Automated Weighbridge System to process cartage fees for the individual carriers. Accuweigh’s Automatic Weighbridge System can be configured for all weighbridge applications. There are various levels of complexity available to ensure satisfaction on individual installations of industrial scales.